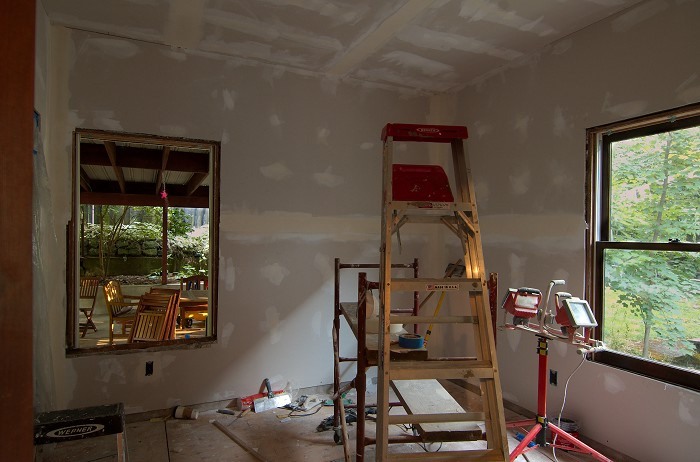 Although these pictures are actually “in progress” pictures, they give a pretty good idea of what the drywall looks like now. We ended up getting a bid from a contractor we’ve used before for $800 vs. the ridiculous $2200 that the guy who did our upstairs wanted to charge us. $2200 to do one room and a hallway ceiling?? As you may remember from the last post on this room, we decided to cop out and have someone drywall over the heavily-cracked plaster in this room. 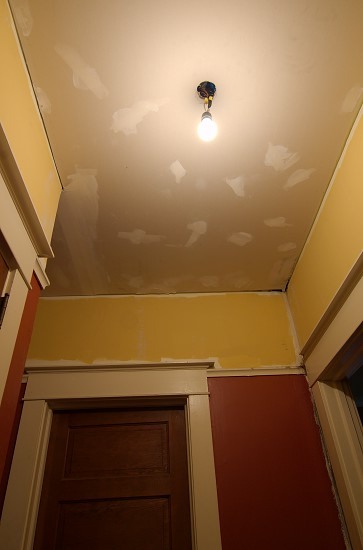 We got a bid by a plasterer, who said it all had to come down and be replaced (for $3200! ), so that was out of the question. And since we are really trying to accelerate progress on our house, we decided to spend the $800 and just get it done. If I were doing this myself, it’d take me longer to just acquire the drywall then it took these guys to get the whole project done. It’s such a great and unfamiliar feeling to see progress on a project when I come home from work! I really like how they installed the drywall. They got 4’6″ x 12′ sheets, so there is only a single horizontal seem on each wall, making for really smooth walls. I love a fresh wall! Looks great!! C is hanging drywall at this very moment. Patching the mess left behind from those lame, lame plumbers we hired.